No first year students were enrolled in a DCU Irish and Journalism course for 2017/18 due to a lack of applicants achieving the CAO points required. The course received a similar number of applications as other years, but they did not get a high enough Irish grade to justify a new class. “While the number of CAO applicants to the BA Gaeilge agus Iriseoireacht programme was broadly similar to other years there was not a sufficient number of applicants who achieved the points required, and who met the course entry requirements to justify taking in a new cohort in year 1” said the Academic Programme Chair for the course Colm Ó Ciardubháin. The course Gaeilge agus Iriseoireacht dropped 70 CAO points last year from 415 in 2015 to 345 points in 2016. A rumour that the course had been dropped first started when the CAO results came out in August of this year, and the course was not featured in the list of course requirements issued by the Irish Times. Former Gaeilge agus Iriseoireacht student Caoimhe Ní Chathail said that the current requirement of an O1 or H4 Irish in the Leaving Cert might even be too low. “I think the points and the grades are there for a reason and because you do need to have a certain level of Irish at least.” she said. Ó Ciardubháin said “I expect that this was a once off occurrence and I look forward to welcoming a new cohort of students in September 2018”. DCU president Brian MacCraith also clarified the issue to Caoimhe on twitter, saying in Irish “this course hasn’t ended Caoimhe. 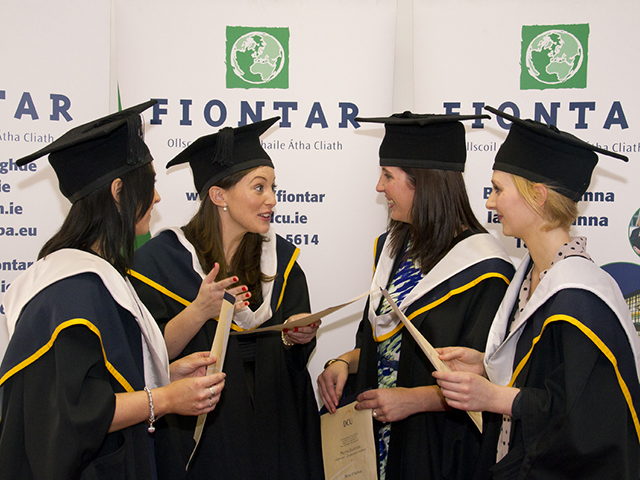 The degree will be available in the CAO list again in 2018 and I hope that there will be interest in the course”.